Kathy's Freedom Tour - Blog! Thank you everyone for all your prayers during this ride as well as watching what was happening. 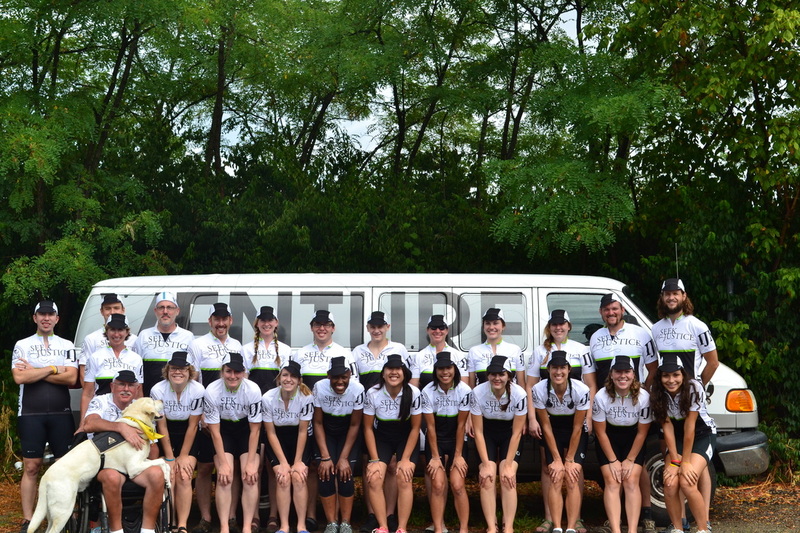 If you have any questions regarding the bike trip I did, human trafficking or maybe even if you wanted to do something similar with the organization I did. Please email me to Freethe27@gmail.com I would love to answer your questions! God bless you!v THANKS AGAIN! Hello everyone! Sorry it took so long to write my next blog post, I have been super busy. Day 3 was the hardest day by far. ; we were supposed to do --- miles but we ended up doing 77 miles due to the pouring rain and lightning. ON day 3 we were riding on the Appalachian mountain highway. We crossed into West Virginia, it was definitely tough. You would be climbing a hill for 10 minutes or more. They were not super steep but they were long and it begins to wear on you very quickly. We were biking for about 10- 11 hours excluding our snack and lunch stops. When I was just about to give up there would be someone who would randomly tell you that you could do this and it helped me tremendously. I love how encouraging they were, I was so blessed to have had a team like that. Thank you for all your prayers! Day 1 of the tour - We were told that we were going to be awaken at 5am to bike. I wake up to a super loud I phone playing unknown music! It was really cold I did not want to get up. But with sleepy eyes I got up and walked with my stuff to the bathroom. I walked over ot the bathroom got my dressed and got ready. I walked back out made sure everything was packed up and then off I went to eat breakfast! By the time I got there most of them had already finished and for Kathy that was not cool considering that I was probably the slowest eater there. So I got a lot to eat because I knew I was going to be hungry soon. I tried to eat but after a few bites they told us we were going to have a meeting but we needed our discovery guide ( a book we read every morning before our ride, with bible verses and encouragement) so I threw out my food and ran to get the discovery guide and when I came back we read it as a group. We hurried got our bikes out and Paul helped me get my bikes out pumped up the tires and then we finally left! I have been thinking about this day for months and it was finally here. I was excited and nervous. We rode a total of 113 miles that day!!!! The ride was very long we were on our bikes for about 13 hours that day but the hills were not that bad until the last 20 miles; that is when they began to get really bad. These “rolling hills” would roll up so steep for minutes. There were some hills where I thought I was going to have to stop and walk it up. They were that bad. Anyways we finally made it to the church where we had to take freezing cold showers because there was no hot water left. By the time I ate and got ready for bed I only had 4-5 hours of sleep. Little did I know that the days ahead of me were going to get harder. Hello! Sorry I was not able to post anything the last few days because I did not have any Wi-fi. Today was the last day and I said good bye to the team which was really hard for me because they were like family; I hope and pray that we will stay in contact. On Saturday, we arrived at the Lincoln Memorial, I think that was one of the happiest moments of my life! To think that I was able to climb those hills and finish strong because of the passion and power that God has given me. This is something that I thought I could never do but God has given me the strength! Going up those hills those prayers and bible verses I quoted helped me so much. With in the next week I am going to try to post a little blog for what happened everyday so keep posted! Thank you so much for your encouragment! Since I am done with this tour does not mean that I am done collecting money. All the money I collect will go directly to stop human trafficking. Please continue to help make a difference in the lives of these girls. You can email me at Freethe27@gmail.com or send me money to Kathy Davis, P.O. Box 22122 Knonxville TN 37933. Please continue to keep updated because I will continue to post pictures and more in depth information on the everyday life of the tour , hopefully I will get to that before the weekend. May God bless you and your giving! Sorry about yesterday. Had like no time. Yesterday we did about 5 miles with the team. We were going a little slow but we were just trying to stick as a team and stay together. Today we did about 12 miles. I know that does not sound like a lot but in some sports they do less before a big tournament or event so that they can have the energy to do it. The goal for tomorrow is to do 84 miles! Tonight we pack and we will wake up around 5 tomorrow and we eat put everything in the trailer do a few chores, check our bikes and off we go. I love the people here they are super nice. We are a team of 26 people. Hopefully some more pictures will go up soon. PLEASE PRAY FOR ME TOMORROW!!! I am the one on the bottom right corner!